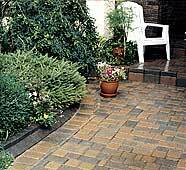 Edge restraints should always be used to prevent the pavers from rolling or spreading. You can use Plastic Edge restraints, NO pressure treated wood, aluminum, concrete or pressure-treated wood. Precast concrete curbs are recommended because they are easy to install, are very durable and will accent your paving stone. Use the 3-4-5 triangle method to make sure that all corners are exactly 90º.